For five years, Nepalese cultural dance classes have been connecting children and teenagers from Nepalese backgrounds that live in St George and Sutherland area with their rich cultural roots and the wider community. Each Sunday, around forty, aged four to seventeen, meet at Shopfront in Carlton to learn Nepalese folk, contemporary and classical dances that have helped to shape and preserve Nepal’s diverse culture in Australia. Dance classes are followed by an education session in which the young people learn about Nepalese values, norms, systems, culture, fables, history and traditions. They are also tutored in basic Nepali language skills. This group has been performing in many local and social occasions organised by councils and multicultural organisations. 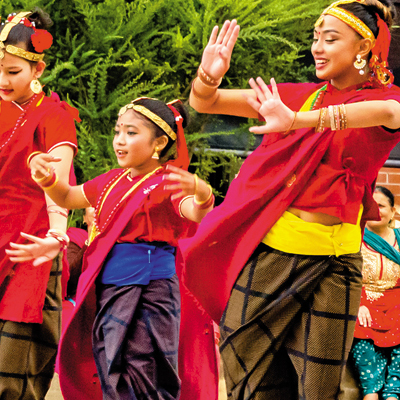 At the New Beginnings Festival in Spring, Advance Diversity Services (ADS) Nepalese Children’s Cultural Dance Group will be proudly presenting the “Dance of Himalaya” which reflects the beauty of the Nepalese culture, cultural diversity, harmony and unity. Brace yourself to be dazzled by the gorgeous cultural costumes, sparkling jewellery, natural facial expressions and dance moves bring Nepalese culture live on stage. The performance is choreographed and directed by Puspha Lamichane.